I eat a lot of salsa. A LOT. I am rather notorious for this, in fact. My friend’s boyfriend once innocently asked if I had anything he could snack on — maybe some chips and salsa? My friend nearly fell on the floor laughing at the thought of me not having chips and salsa in the house. There is no risk of that. Ever. So when my awesome world-traveling chef cousin came to town for a few days, she offered to teach me how to make roasted red salsa and tamales (more on that later). Can you imagine how much I hesitated? Not. At. All. 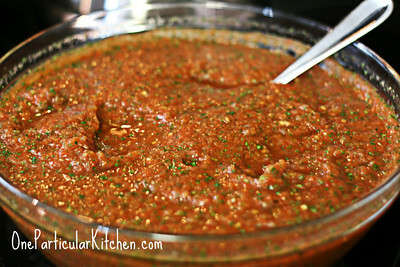 And people, this salsa. PEOPLE. With a lifetime of tasting, sampling, and gorging research on salsa, I have never in my life had salsa this good. Stir it all together and eat with abandon. Trust me. Got questions? Be sure to see the comments below from The Cousin — lots of great info from the salsa expert! 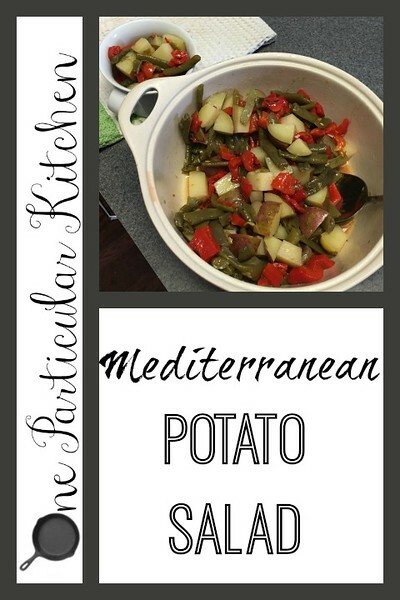 I found the original recipe for this at Simply Recipes while searching for a mayo-free potato salad. When it’s a million degrees here I want something that can handle the heat and stay safe longer than mayo-based salads. This has become a staple in my house! It’s good cold or at room temperature, and the simplified version I make comes together crazy quick. Variations: you can change out the lemon juice for any kind of vinegar: champaign, red wine, balsamic, or apple cider vinegar are all good. You can add some Tony Chachere’s or similar in place of some of the salt if you like a kick to it. Once it’s been chilled in the fridge, I like it to sit out about 30 minutes or so till the chill is knocked off a bit; then it’s perfect for me. What other variations should we try? The Yankee recently made a discovery, and I’m in love. 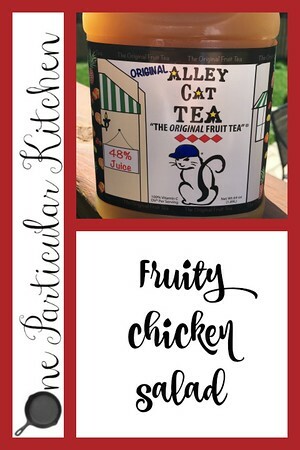 I used to buy gallons of fruit tea from a BBQ joint called JJ’s in Spring Hill, TN. It was amazing, and usually came in a washed out gallon-size pickle or mayonnaise container. Fine by me, as long as it ended up in my kitchen. We moved away from Spring Hill about nine years ago, though, and I have been fruit-tea-less and bereft. My favorite is to just drink it straight, but a little Jack Daniel’s in it doesn’t hurt either. 😉 I wanted to find a way to cook with it, too, so I made this fruity/fruit-tea (see what I did there) chicken salad and it’s SO GOOD. It has sweetness from the tea, pineapple, and craisins; it has a tiny bit of sour from the lemon juice, and the chicken holds it all together. It does not have celery, because I don’t like eating dental floss. This is amazing served as a sandwich on Hawaiian rolls, and also great with crackers for little appetizers. Enjoy! I know. 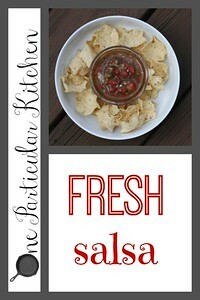 A salsa recipe! From ME! It’s shocking. I’ll give you a minute while you collect yourself. This one comes courtesy of my BFF’s boyfriend, and it is so good. Very different from my usual roasted salsa roja, and perfect for right now when the tomatoes are in season and easy to find. Around here we can still find a farmer with a card table of tomatoes and a cigar box for cash sitting out at the end of the driveway. 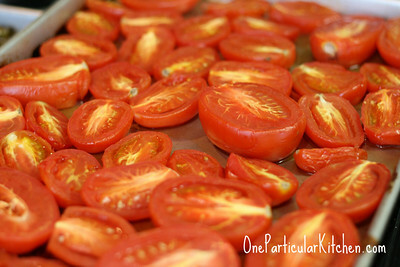 Best tomatoes in the world! Anyway, the salsa is also easily customizable, so you can make it anywhere from diced tomatoes to melt-your-face-off hot (which, you’ve probably figured out by now, is my preferred level of heat). *A note on cilantro: for the last three years or so I kind of hate it (pregnancy was weird), so the first time I made this myself I just left it out. And I MISSED it. It really makes that much of a difference, so my advice is to try just a little bit in it even if you think you hate it. Random: this reminds me so much of the now-defunct Salsa Y’all. Does anyone else remember that? Hi, I’m writing a blog post. It’s been forever and I may not really remember how, so bear with me. I’ve not been blogging. I have been gardening, toting two kids back and forth to two different schools, going to the beach, learning ASL with Peanut (thanks, Signing Time! ), and visiting with family. And, you know, drinking lots of coffee. Normal. But now! 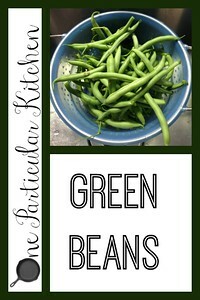 Let’s talk about green beans. It’s one of the few things I can grow in my back yard that doesn’t fall prey to the squirrels, birds, and bunnies. My tomato plants require a moment of silence and deep breaths before I can even look at them. The beans, however, are everywhere. I pick them every few days, and get about what’s in that picture up there. There are… a lot. And I am thrilled with this. One of my favorite books is Will Clower’s The Fat Fallacy. 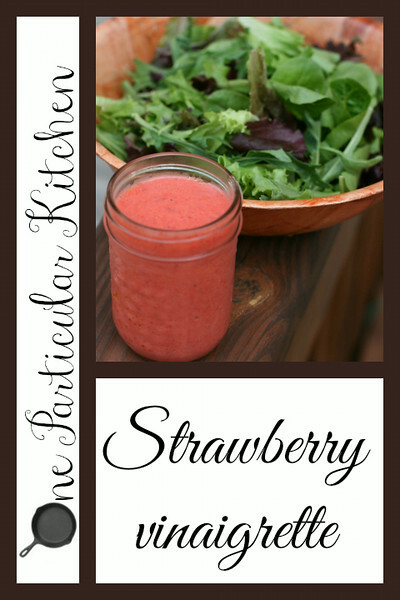 It is smart, and makes sense, and has some really incredible (and incredible easy) recipes. 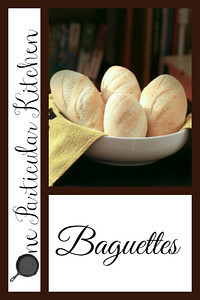 One of my favorites is this super simple recipe for baguettes, which I make a few times a week. Kiddo cannot get enough of them! He likes them plain in his school lunches. I like them hot out of the oven with butter. The Yankee likes them with whatever we’re having for supper. Peanut likes to throw them like lawn darts. Three out of four ain’t bad. One of my favorite bread tips also came from this book: if the bread is stale or not as soft as you like (Kiddo likes it SUPER soft), just run your hands under water and then over the bread, or spritz the bread with a water-filled spray bottle, then reheat in the oven or toaster oven. Magically you have soft, warm bread, even if it’s days old. If it’s really past it’s prime? Cut into squares and bake into croûtons, or use for French toast. But really, the chances of it hanging around to get past its prime are slim. It’s really, really good. I make these often enough that I bought this perforated pan but you certainly don’t have to; a regular cookie sheet is fine. 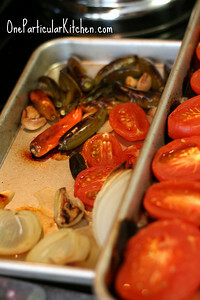 Bake for 20-30 minutes or until bread is as brown as you like. Cool at least ten minutes, then dig in! The schedule of events is here! And congrats to commenter #6, Leah of So How’s It Taste for winning the Ball prize pack! Leah, just shoot me your address and I’ll get your info sent over. 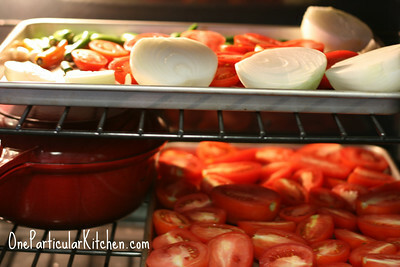 It is no secret to any of you that I adore kitchen classics; cast iron pans and Mason jars are at the top of the list. When Ball contacted me to see if I wanted to do a giveaway with them for the inaugural International Can-It-Forward Day I was ALL OVER THAT. This is stuff I use in my kitchen every single day, and have for years before I even started a blog. On Saturday August 16, Jarden Home Brands will host the first annual International Can-It-Forward Day with special guest renowned chef and Bravo’s Top Chef judge, Hugh Acheson! A day to celebrate home canning, International Can-It-Forward Day allows food enthusiasts to connect via a variety of online and in-person activities. New and experienced canners can participate in a live webcast on http://www.frespreserving.com, taking place on ground in Brooklyn Borough Hall Farmers Market, filled with canning demos where viewer questions will be answered in real-time by Chef Acheson and other experts while they learn the most popular (and delicious) home canning recipes. Twenty five farmers markets across the country will also be hosting Can-It-Forward Day celebrations! In addition to the canning demos, there will also be segments on crafting, herb gardening and the brand’s new drinkware line! We will also be attempting a Guinness World Record for the World’s Largest Mason Jar Mosaic! I’m required at this point to tell you that Ball provided me with all these goodies to review at no charge, but for heaven’s sake y’all already know I love the stuff. Opinions are mine, and I’m not paid to say how much I adore them. I just do. Giveaway closed! Thanks, y’all, and CONGRATS LEAH! Let’s make this easy: just leave a comment below telling me which item in the prize pack you’re most excited about, and what you’d use it for (or for what you would use it, in case my Aunt Jane is reading). Want an extra entry? Pin this post and come back and leave an additional comment telling me you did. I’ll use random.org to pick a winner after midnight on August 15, central time.